Travis Wammack had a one-off hit with the title track. His sound is super fuzzy, almost silly. Country boys just don't quite get fuzz. All of these tracks were cut between 1961 and 1967, and issued between 1964 and 1965 on ARA Records, and 1966 and 1967 on Atlantic. This disc is mastered from the original Roland James sessions recordings. 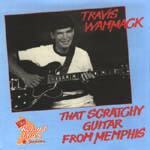 Travis Wammack was 18 when he cut "Scratchy" in 1964 using his homemade fuzz effect from a converted tape recorder. Backing Travis on this disc are Memphis studio session men Reggie Young - rhythm guitar, Smoky Joe Baugh - piano, Stan Kessler - bass, Blind Jimmy Smith - sax, and Johnny Fine - drums. Travis was 12 when he first recorded, and was already a veteran performer, sitting in on drums behind Charlie Feathers and Bill Black. He later toured with the Allman Brothers Band, Tony Joe White, and Grinderswitch, and performed on sessions with Little Richard, Percy Sledge, and the Osmonds. There are a handful of vocals here as well as his trademark guitar, including "Your Love," the heavy duty "Hallelujah, I Love Her So," the weird monster laugh introduced theremin wailing "There's A UFO Up There," the almost pop "Find Another Man"
James Brown and his Famous Flames did wonders for this tune. The drummers' accelerating train beat in the intro is quite precise. Travis Wammack brought it to an almost comical place with the extreme swirling fuzz and boxy sound. "Fire Fly" was the B-side of his one big hit "Scratchy." It buzzes and flits around with gay abandon, having more fun per byte than is prudent. No sustain on the guitar, just damped country junk a la Jerry Reed. The rhythm section here is offering up a demented "Woolly Bully" kinda chunk, while Travis Wammack plays with the guitar like it's a brand new toy. Quite fun, if a little silly. "Scratchy" was the 1964 Billboard hit for Travis Wammack. It's a mighty fuzzy rant, melodic and as square waved as Davie Allan, but lighter and more humorous. This clearly shows off the edge of his homemade fuzz box. The backwards talking in the break is hilarious. Piano boppin' blue boogie, with dry short sustain country guitar, slightly fuzzed for edge. Not much of a melody, but a pretty infectious rolling meter. One of the great instro version of Richard Berry's landmark rock anthem. With an almost churchy organ, and a thin ultra fuzz guitar, Travis Wammack makes this into an event. They're havin' too fun, what with there shoutin' and yelpin' and carryin' on. Speedy Jerry Reed-ish picking, a minimal riff, and a countrified blues backtrack. The Harmonica is good. The Duane Eddy "Moovin' and Groovin' "riff in the bridge is a nice touch. Not the sorta country mush the title would imply. A bouncy backtrack with a walking bass line under a flash and show lead line. Some extreme choking and lots of "Church Key" whammy dips. Churning chunky rhythm guitar that almost double for an organ, relentlessly pumping out a "Woolly Bully" kinda thing. Mostly a frat rockin' rhythm song. Big vibrato fuzz and a Memphis soul beat, with soulful cries of "aw right" to make it more credible. Purely B-side material. Extreme whammy and extra fuzz, all played on the middle registers, sounding almost as thin as a Marshall. Riff rockin', fuzz twankin', with a nifty damped rhythm guitar like surf without reverb. Raw textured and edgie. Like "Scratchy, Part 2" would be... an obvious attempt at recreating the hit. More embellished and demented (really), with a rounder fuller guitar sound and more precise picking. Flying fingers and uncomfortable use of whammy. Disquieting and magnetic, like a car crash on the other side of the freeway. Freddie King' "Hideaway" with the "smooth" replaced by "fuzz." An interesting, but more or less soulless rendering, yet somehow endearing. Travis Wammack's style is so out there that almost anything becomes intriguing. The "Peter Gunn" break is very cool. Chunky, almost losing the melody in the pickery plucking. Both interesting and a little too contrived. This standard served as the A-side of Richard Berry's "Louie Louie." This is arranged much like Lonnie Mack's version, but less twangy and soulful. The track shares some qualities with the Johnny Rivers version.